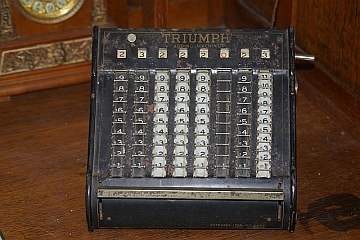 "The Triumph is a smaIl adding machine. Manufacturer: Triumph Precision Machine Co., 74 Wall St., New York." 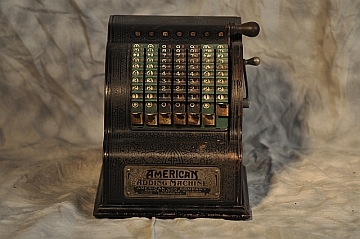 "This is a single-row adding machine from the Addall Company, Temple Courts, Temple Row, Birmingham. This machine disappeared from the market a number of years ago." "This small machine was brought out by the Württembergische Uhrenfahrik Bürk Söhne in Schwenningen on the Neckar. It never gained a really wide distribution and today is no longer being manufactured." "Designer: Alexander Rechnitzer of Vienna. Manufacturer: the Autarit Company, Ltd., of Vienna 1, Fuehrichgasse No. 10. Production has been discontinued since the beginning of the war; the firm is no longer in existence. 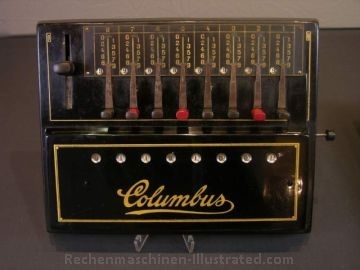 This is a stepped drum machine, with motor drive for completely automatic multiplication and division." "Manufacturer: Midget Sales Company, 60 Van Buren St., Brooklyn. The machine is only used for addition. " production years 1910 - ??? and three models for English currency." "Designer: Glen G. Barrett. 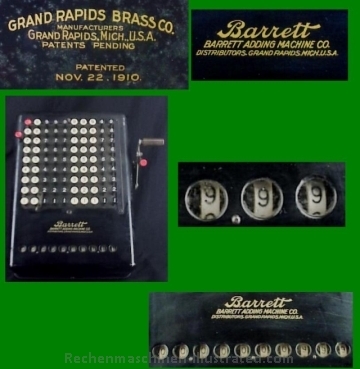 Manufacturer: originally the Barrett Adding Machine Company, 142 Court St., Grand Rapids; since January 1 , 1922, Lanston Monotype Machine Company, Philadelphia." 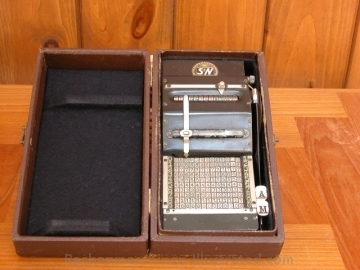 manufacturer: Graber Calculating Machines Co., New York, N.Y.
"The Tourtel is a printing adding machine with setting levers just like the pin-wheel machines. It is equipped only for English currency. The lever on the right side of the machine is marked F (farthings), followed by D (pence), I (shilling), and finally 10 (shillings). 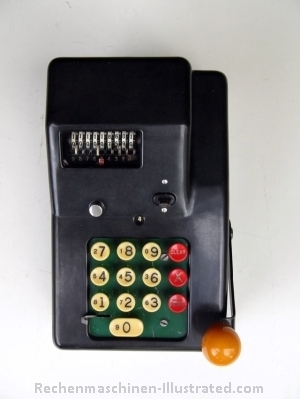 The remaining three levers are for pounds - the machine is thus capable of adding up to £999. The designer is John Mesny Tourtel, London. 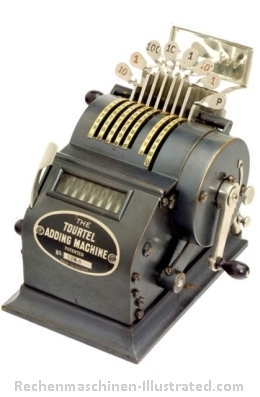 and the manufacturer is The Tourtel Adding Machine Syndicate, Ltd.. 57 Chiswell Street, London E.C. " 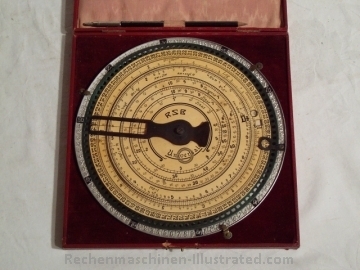 "This pinwheel machine is manufactured by Joseph Köpfer und Söhne G.m.b.H. in Furtwangen (Baden) and is distributed without any special advertising. The locking device on the machine has been patented - it prevents the crank from being turned before it is in the correct position and also prevents the machine from being damaged by incorrect handling." 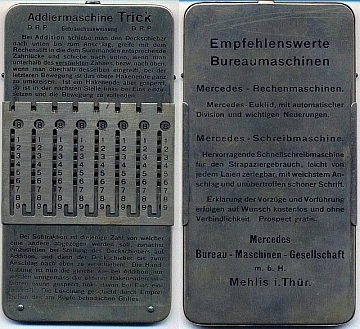 "This machine was brought onto the market by Sirius-Werk, Wilhelm Keil in Nördlingen. 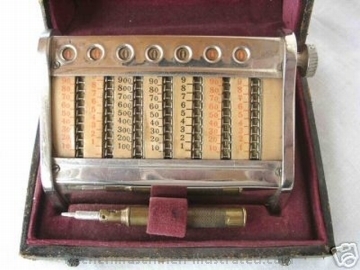 It is shaped like a cash register with vertically positioned calculating gears. In place of the setting windows, the calculating gears have handles with knobs by means of which data entry can be carried out manually. The machine had nine places and cost 150 marks, but it has now disappeared from the market." "Designer: Roberto Taeggi Piscielli in Naples. 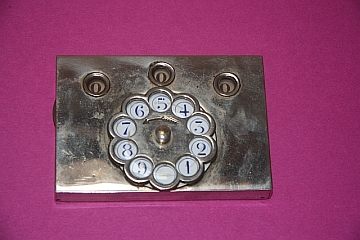 Manufacturer: Société Industrielle des Téléphones, of Paris. Sales agency: S. A. des Anciennes Establisements Nico Sanders, Paris. 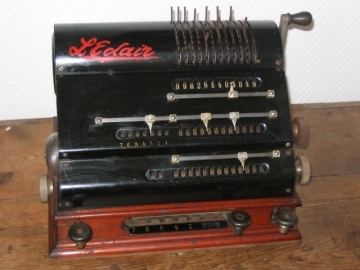 Originally the machine bore the name L'Eclair. It has a remarkable pinwheel construction with electric drive." 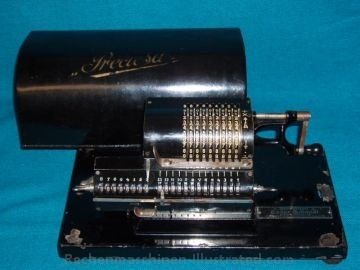 "The firm Procento, Ungarische Rechen-und Schreibmaschinenfabnk A-G in Kassa, used this name for both a stepped drum machine without any special features and a pinwheel machine as represented in figure 230. The latter was designed especially for calculating interest, but further details are unavailable. Today, the business carries the firm name Laplace Rechenmaschinenwerke und elektrische Uhrenfabrik, Inh. Victor Bernovits, Komenskeho ustav, Kosice, Czechoslovakia. note: the Rema machine in front of the Procento is used for further calculations with the Procento results; there is no mechanical connection between the two machines. 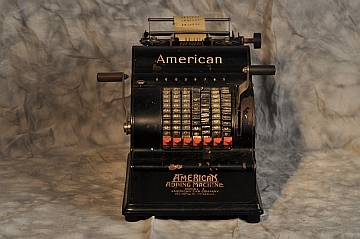 "This is a nonprinting ten-key adding machine of the Austin Adding Machine Corporation, 927 Linden Avenue, Baltimore." "The Teetzmann machine is distinguished from other pinwheel machines largely by the fact that it has nine setting levers and control windows in front of the carriage. It is possible to operate the setting levers with the left hand only, while the right hand remains on the crank. The machine is 20 cm long and 17 cm high. While there are only a few of these machines in Germany. a large number of them have been supplied from Manchester in England, and overseas under the name of Colts Calculator. 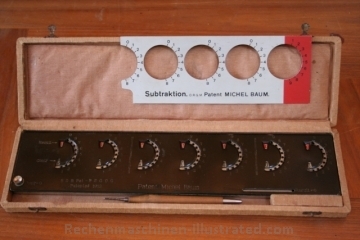 Manufacturer: Teetzmann and Company, G.m.b.H, Charlottenburg. Frauenhofer Strasse 18/19. In July 1915, this firm went into liquidation and the machine is no longer being manufactured." 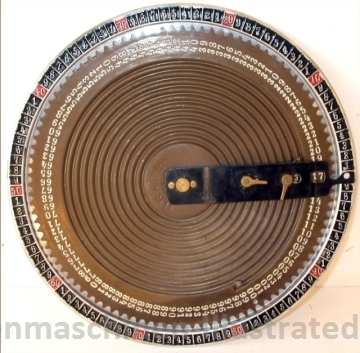 "The Burroughs Calculator closely resembles the Comptometer described earlier. 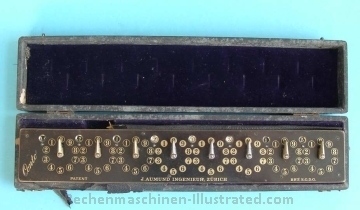 It is a calculating machine in which the keys directly operate the calculating mechanism, which is underneath the keyboard, so that neither crank nor electric drive is necessary. The machine is only available in seven-place or thirteen-place versions; both models have an extra place in the result mechanism. There are special models available for fractions and English currency. 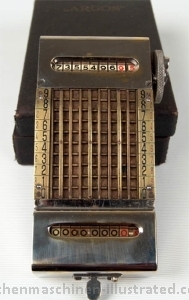 Manufacturer: Burroughs Adding Machine Company, Detroit." 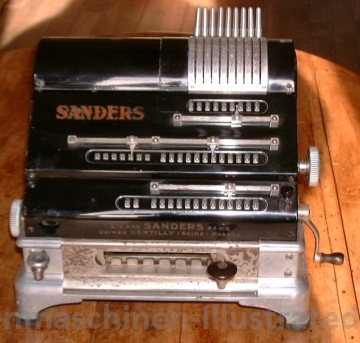 "Manufacturer: Carl Landolt, Thalwil near Zürich. 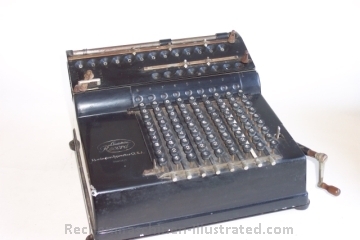 This is a cogged disk adding machine. 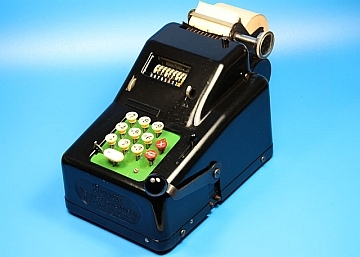 This machine is available with six, eight, ten, or eleven places and for English currency with either nine or ten places." prod. years 1912 - ???? 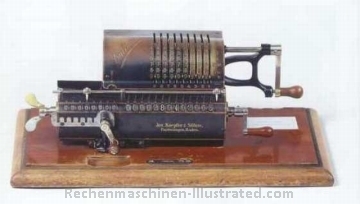 "In appearance this machine resembles the Pebalia, but it is of a fundamentally new design and new patent. It was brought onto the market by Michel Baum, Hohenzollern Strasse 54, Munich." "Designer: Hugo Cordt, of Nordenham. 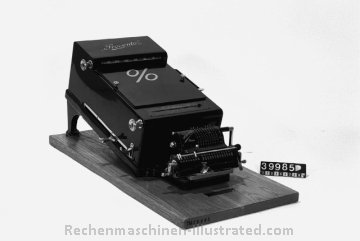 The first machines were sold under the name Tasten-Universal Rechenmaschine and manufactured, at that time by the Nordenhammer Rechenmaschinen A.G. in Oldenburg. 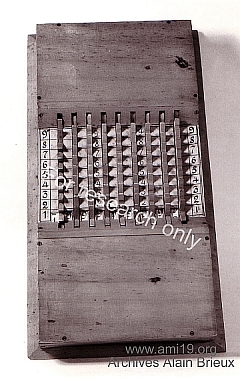 The original machine is shown in figure 238. In 1914 the production was taken over by the Rechenmaschinen Fabrik, H. Ohlmann & Company of Oldenburg, which then moved it, in the same year, to Berlin SO 16 Kopenicker Strasse 72. At present the sole manufacturer, and owner of the patents, is Karl Lindstrom. A. G. of Berlin SO 33 Schlesische Strasse 26." prod. years 1913 - ???? 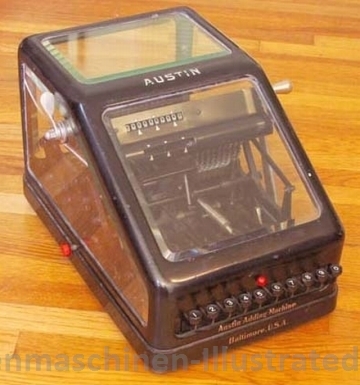 "This is a small adding machine with chain setting. 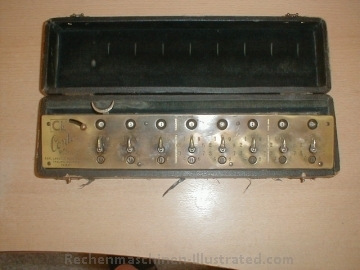 The manufacturer was Gesellschaft fur Präzionstechnik G.m.b.H, Aite Jakob Strasse 20, Berlin SW 68. It was sold principally in Germany and, to a lesser extent, in France." production years 1913 - 1914? 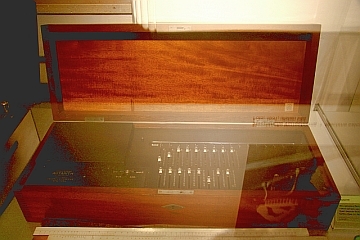 "the designer of this machine is Max Klaczko, Riga, Scheunenstr. 19." "This machine was originally manufactured by the American Can Company in Chicago, which began production of the printing model on May 1, 1922. The nonprinting model is now distributed by the American Adding Company, 35 South Dearborn St., Chicago. 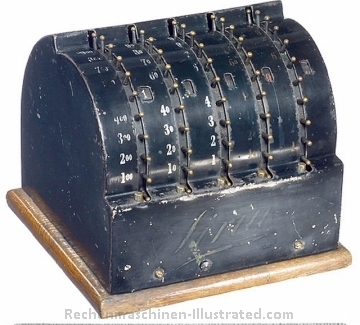 This machine was introduced into all the most important European countries in 1914." 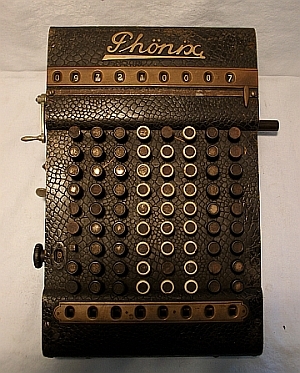 "This machine came on the market in 1913, but at that time it was under the name White. 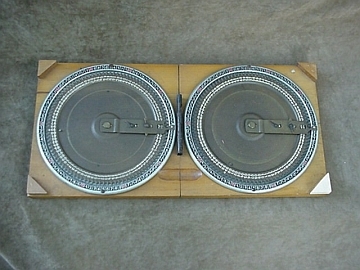 Its designer was also the builder of the Wales machine of the time. 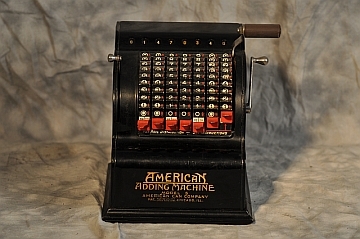 The original manufacturer was the White Adding Machine Company in New Haven, Conn., but later the patent went to the Federal Adding Machine Company Inc., 33 East 21st Street, New York. They looked after the retail side themselves, but let the Colt’s Patent Fire Arms Manufacturing Company in Hartford, Conn. manufacture the machine. 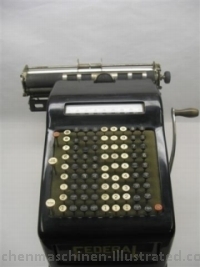 It is a full-keyboard adding and subtracting machine with self-correcting keys that are colored in groups. 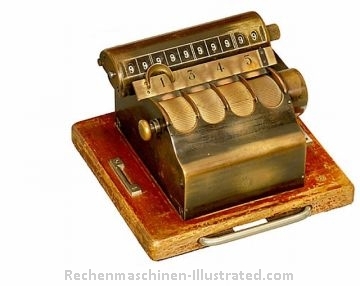 Subtraction and division are carried out with the aid of complementary digits, which are not, however, inscribed on the keys. Correcting, total. subtotal, nonaddition, and nonprinting keys are all found on the left and a repeat key is on the right of the keyboard. 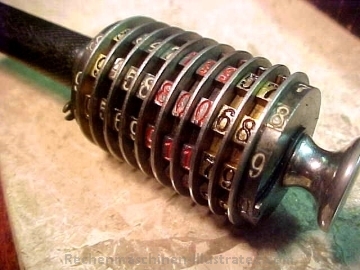 The subtotal key also serves as the correcting key. " 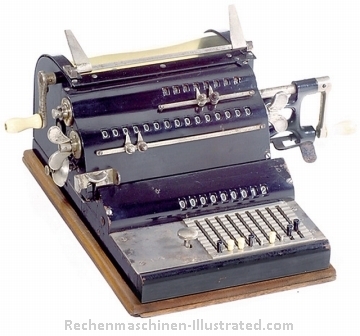 "This is an eight-place, nonprinting, full-keyboard adding machine. The values entered can be checked for accuracy in the windows under the keyboard be-fore they are transferred into the result mechanism. Subtraction and division are carried out with the aid of complementary digits. 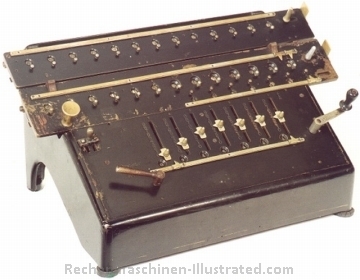 In order to save counting the number of turns of the crank during multiplication and division, the machine is equipped with a counter, on the left of the keyboard, that releases the pressed keys after the crank has been turned the required number of times. After this release the machine stops accumulating, even if the crank continues to be turned. Manufacturer: Phönix Bureaumaschinenwerke, Robert Laupitz, Radebeul."